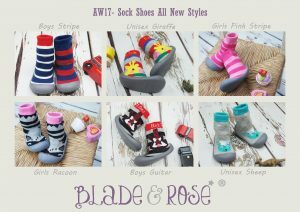 Britain’s iconic children’s fashion brand, Blade & Rose, has more on offer than ever before now with the addition of six new designs of Sock Shoes including a Guitar, Sheep, Giraffe, Racoon and boy and girls Stripe; all guaranteed to keep little feet warm, cosy and happy this season! Perfect for home and away, and the ideal present for little ones taking their first steps. Perfect for little animal lovers on colder days are the Unisex Giraffe, Unisex Sheep and Girls Racoon designs. 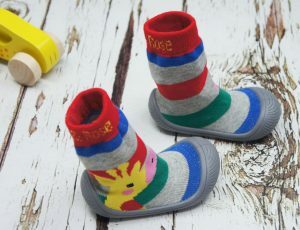 (£20) these super comfortable Blade & Rose Sock Shoes with the animal faces and striking red, yellow, turquoise, pink and grey colours are made from the softest cotton and rubber soles and are sure to keep your little ones feet warm, cosy and non-slip and this winter. 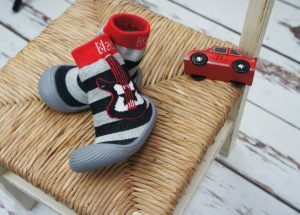 Little musicians will fall in love with the Blade & Rose super star Guitar Sock Shoes (£20) which can also be paired with the music-inspired guitar baby leggings (£10). Featuring the eye-catching black and grey bandit stripes and showbiz guitar on the sides, these Sock Shoes made from comfortable and super-soft fabric will provide added warmth against chilly autumn and wintery nights. 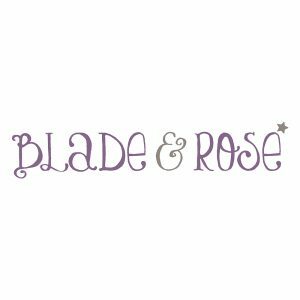 Blade & Rose is Britain’s leading children’s clothing brand specialising in trendsetting leggings featuring stylish and quirky designs on the bottom and accessories. The company founded by entrepreneurial mother of two Amanda Peffer during her maternity leave naming the company after each child’s middle name ‘Blade’ and ‘Rose’. Inspired by her then 3 month old daughter, who always had the bottom of her leggings on show, Amanda found herself constantly pulling down her daughters dresses until she decided to embrace the beautiful bottom sticking out and design a fun range of leggings around this concept. A major component of the development was to ensure that the quality of the fabric was durable, functional, would wash well and most importantly, that was soft and kind to children’s delicate skin. The initial range quickly sold out and now the British family business has stockists all over the world including Germany, France, Spain, Belgium, Italy, Netherlands, Greece, Japan, US, China & Dubai. Blade & Rose continues to go from strength to strength with an expanding product range including children’s hats, tops, socks, bibs, hoodies and new for 2017; sock shoes and wellington boots.